San Antonio – November 30 – The streets of Texas’ second-largest city are going to be rocking this weekend as thousands of competitors don their running shoes to take part in numerous events that comprise the Humana Rock ‘n’ Roll San Antonio Marathon & ½ Marathon weekend. At the front of these races, that include the 5K, 10K, half marathon, and marathon will be some of the fastest runners in the world and include defending champions. “Humana Rock ‘n’ Roll San Antonio is a fantastic way to round off the season and the event works for a variety of reasons for athletes,” said elite athlete manager Matthew Turnbull. “It’s great to have the caliber athletes both domestically and internationally coming into town this week”. In the men’s half marathon, last-year’s champion Mark Pinales returns to defend his crown. The 24-year-old from Round Rock, Texas, set his personal best two years ago at the Rock ‘n’ Roll Philadelphia Half Marathon and is a 2016 Olympic Trials qualifier. Expected to battle the defending champ to the finish line is Stanley Biwott who also has prevailed in San Antonio back in 2012. The Kenyan raced San Antonio that year due to the cancellation of the New York City Marathon and owns the event half-marathon record. Biwott has an impressive racing resume, having won the Rock ‘n’ Roll Philadelphia Half Marathon twice. He’s also prevailed at the prestigious New York City Marathon and owns the world record for 30K. His half-marathon personal best is a blazing 58 minutes and 56 seconds. Running legend and 4-time Olympian, Meb Keflezighi, will also return to San Antonio and make a series of appearances after officially retiring from the sport earlier this month at the New York Marathon. The women’s half-marathon race also has the appearance of defending champion: Anita Perez. Like Pinales, the San Antonio resident also set her personal best in Philadelphia. She is setting her sights on wearing the American singlet at the 2020 Summer Olympic Marathon, having qualified for the Olympic Trials last month in Chicago. Perez will have a challenging rival on the historic streets of San Antonio. Desiree Linden, who happens to be the fifth-fastest marathoner in American history and is a two-time Olympic marathon participant is seeded behind Perez (with bib #302), but is arguably the clear favorite in the 13.1-mile race. The marathon should be equally exciting with Ryan Miller from Midland, Texas making his debut in the 26.2-mile distance. The 26-year-old has run 1:04:35 in the half marathon and qualified to compete in the 2016 U.S. Olympic Marathon Trials. Miller, who grew up in Boerne, Texas, has been a big name in Lone Star-state running circles, having won the state high school championships in 2008-2009. Expected to give Miller a run for the money is David Rodriquez of Corpus Christie, Texas, who was fourth in the 2015 edition of the Woodlands Marathon. The women’s marathon is also expected to be a thrilling duel with Caroline Veltri of Boulder, Colorado seeded first. Veltri is a versatile runner, having won marathons as well as ultra marathons. She took first at the 2017 New Jersey Ultramarathon festival 50K. Janessa Dunn of San Antonio will be wearing the F2 bib. Dunn has clocked 3:00:17 in the marathon. Her half-marathon personal best is 1:19:32. Women’s running pioneer, Kathrine Switzer, will be taking part in Saturday’s 5K and Sunday’s half marathon. Fifty years ago, Switzer became the first woman to complete the Boston Marathon starting the fight to overcome gender stereotypes. Her foundation, 261 Fearless – named after the original bib number she ran with — supports women in the sport of running and is one of the featured charities of the weekend. Through her partnership with Humana, the 70-year-old is now focused on inspiring seniors to achieve their best health and experience all life has to offer. This year marks a special edition of Humana Rock ‘n’ Roll San Antonio as the event will be celebrating its 10th anniversary. Speedy runners aside, all competitors and spectators are in for a real treat. The scenic course winds through San Antonio’s beautiful streets and past numerous historical landmarks like the Alamo, the Tower of the Americas, Mission Concepcion, and the San Fernando Cathedral. The weekend festivities kick off on Friday when the health and fitness expo opens. Saturday will feature the shorter-distance races (5K, 10K, and the Subway KIDS ROCK race) and at 7:15am on Sunday the starting gun will fire for the iconic half and full marathon events. American rhythm and blues band Vintage Trouble will headline the Toyota Rock ‘n’ Roll series finish-line festival at the city’s Hemisphere Park, giving runners and their families something to dance to at the end of an incredible weekend of entertainment and exciting racing. 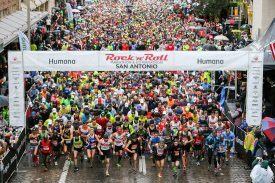 The 10th annual Humana Rock ‘n’ Roll San Antonio Marathon & ½ Marathon will return the weekend of December 2-3, 2017. Live bands, cheerleaders and spectators will entertain participants along the scenic course, which starts on Presa St and Market St and finishes near Hemisfair Park and La Villita. The race concludes with a finish line festival and post-race concert. Runners who complete any distance on Saturday and any distance on Sunday will earn a special Remix Challenge medal in addition to each race’s finisher medals. A two-day Health & Fitness Expo kicks off race weekend at The Henry B. Gonzalez Convention Center on Friday, December 1 and Saturday, December 2. The free Expo is open to the public and will feature the latest in running apparel and nutrition products. For more information about Humana Rock ‘n’ Roll San Antonio, please visit RunRocknRoll.com/San-Antonio or follow on Twitter @RunRocknRoll.